Sometimes, we all experience increased cravings for foods. We make our path to the fridge every 30 minutes and fish something out of there regardless of how many calories or how much fat that food has. 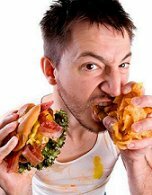 I think this situation is familiar to many of us, and below you can check out 7 most effective ways to prevent overeating and suppress our endless food cravings. 1. Do not skip meals. Do not skip neither breakfast, nor lunch and dinner, and do not forget about having 1 small bite between the meals. Those will help you avoid eating before going to bed. 2. Avoid having high-calorie foods as a bite. Of you want something sweet, eat a palmful of dried fruit or a teaspoon of organic honey, or a small piece of dark chocolate. If you want a sandwich with a piece of ham and cheese, eat a little bit of low-fat cheese with a slice of tomato and a piece of dark bread. If a cup of cappuccino can do as a bite for you, use low fat milk. 3. Use special aromatherapy vanilla candles. It is believed that vanilla smell can suppress hunger and prevent overeating. 4. When you are under attack of food cravings, drink a cup of herbal tea with a teaspoon of organic honey. 5. Cook your meals for yourself. Specialists say that cooking is linked to more balanced diet and nutrition habits. 6. Make a habit of not eating anything while you are watching TV. That kind of eating habits contribute the most to consuming unhealthy foods and developing extra weight. 7. Brush your teeth three times a day after every meal. Japanese experts say that those people who brush their teeth that way have much lower risks of developing weight management problems. This entry was posted 8 years, 11 months ago.